KANSAS CITY, Mo. (Reuters) - Record flooding along the Missouri River has impaired treatment of drinking supplies in Kansas City, raising health risks for infants, the elderly and other people with compromised immune systems, the municipal water service warned on Saturday. The crest of the flood-swollen Missouri, America's longest river, rolled through Leavenworth on Saturday, inundating miles of farmland and wooded areas along both banks in murky brown water. It was expected to reach Kansas City on Sunday. The KC Water utility, which serves 170,000 mostly residential customers in Kansas City, Missouri, with water drawn from the river, said it had failed to meet "enhanced treatment technique standards." Testing showed excessive levels of turbidity, the presence of fine particles in the water that can carry bacteria, viruses and parasites including Cryptosporidium, which can cause diarrhea. KC Water spokeswoman Brooke Givens said Cryptosporidium itself has not been detected, but "the state requires us to notify customers" whenever testing shows that the treatment system's filters are failing to control turbidity alone. "With all that runoff, we're seeing river conditions like we haven't seen in more than a decade," she told Reuters. KC Water said the diminished water quality is not considered an emergency but advised customers with compromised immune systems, the elderly and those with infants to seek advice from health care providers. Floods were unleashed by last week's "bomb cyclone" storm, which dumped torrential rains on top of hundreds of square miles of the snow-covered Plains, sending record flows cascading into the Missouri River watershed. The flooding killed at least four people, drowned livestock and closed dozens of roads across a wide swath of Nebraska and Iowa. Property and financial losses were estimated at more than $3 billion in the two Midwestern states. 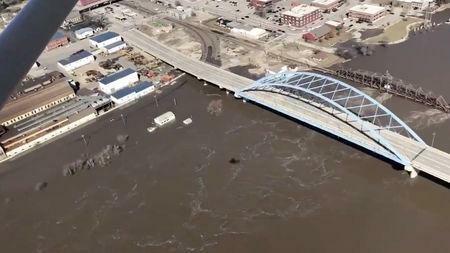 The engorged river crested higher at a record level of over 32 feet (9.75 meters) on Friday at the waterfront city of St. Joseph, Missouri, forcing thousands of residents to be evacuated from low-lying areas. Records were previously broken at several other locations along the river. As the floodwaters at St. Joseph receded on Saturday, a city spokeswoman said evacuation orders had been lifted. But the river in Leavenworth on the Kansas side just downstream crested at 31.4 feet, the second-highest on record after a 1993 flood in which the river topped 35 feet. 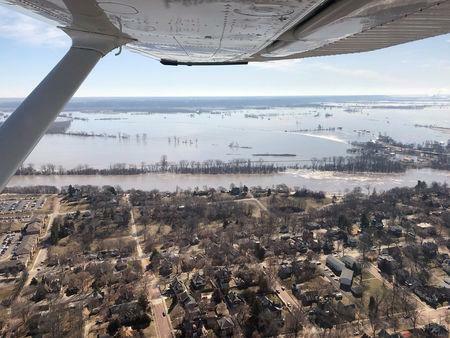 Stretches of the Missouri and Mississippi river basins still experiencing flooding could see more rainfall in the coming days, the National Weather Service said in a bulletin on Saturday.